Wayne and I participated in the Auburn Christmas Count today. 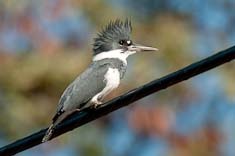 We counted 56 species in the area west of Auburn Way from Emerald Downs south to Ellingson, birding primarily around Fred Meyer, Emerald Downs, the new Main Street mitigation area and the ponds on Ellingson at C street. The fields between the race track and Hwy 167 were the most productive area, with lots of ducks along with an adult Peregrine Falcon and a Coyote, both taking a break from duck hunting. 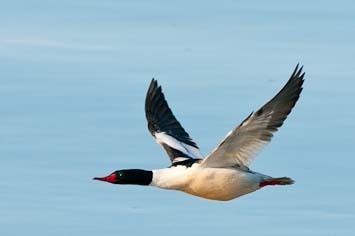 We also had a nice variety of ducks at the Ellingson ponds, including the three diving ducks above. We arrived yesterday and are staying in Maalaea again, this time just one condo building down from the little park at the end of the road. 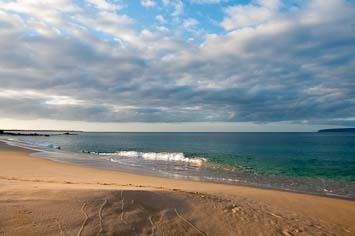 We're on the second floor in Hono Kai #B3 and the beach is just 30 feet from our door. The temperature is perfect, around 80F during the day and 65-70F at night. The sun rises over the west ridge of Haleakala sometime around 8AM and sets over Kealaloloa Ridge sometime before 6PM. We sit on the small balcony off our living room and watch the activities around the pool and lawn of the condo next door, and on the beach beyond. Unfortunately I have a head cold and perhaps even a bit of a fever, so we didn't do much today. 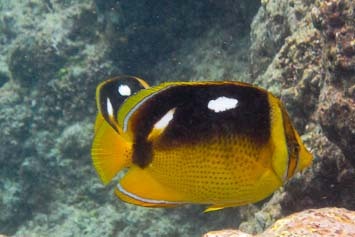 Eventually we set out for Kihei to get some food and rent snorkel gear. At Snorkel Bob's Susan, thinking we needed to try something new for a change, bought tickets to a luau performance next Tuesday evening. I was OK with that until I saw the price, $298 for the four of us. Prices were better at the farmer's market, which didn't close until twenty minutes after we arrived. It was better stocked than I remembered from our last visit four years ago. We bought papayas, avacado, pineapple and a few vegetables. The boys tried out their snorkel gear our in front of the condo before we returned to Stella Blue's in Kihei for a rather ordinary dinner. Determined to get out early, the boys and I left Susan at the condo and drove down to Big Beach. We walked down around the point at the south end of the beach and took a bunch of photos then returned to the car and drove down a bit farther, to a cove right by the road where snorkelers were getting ready to go in. 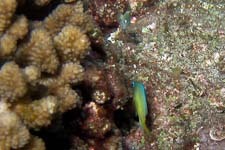 I think it was Ahihi Cove. Though improving, my sinuses still felt pretty clogged so I helped the boys get ready then drove farther south to scout out La Perouse Bay while they snorkeled. The road crosses the relatively fresh and very rough A'a lava flow of 'Ahihi-Kinau Preserve for about two miles before ending at the parking area for La Perouse Bay. The ancient Hawaiian King's Road continues across the A'a past low stone walls, the ruins perhaps of former settlements. Expecting paving stones, I was disappointed to find that the King's Road is now just an ORV track leading into over-browsed kiawe groves along the shore. 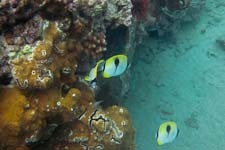 The boys were waiting for me when I returned to Ahihi Cove. They'd seen eels and turtles and lots of fish. In the afternoon I went out with them in front of the condo for an hour or so. 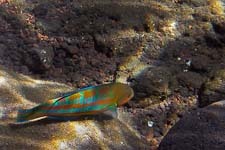 The water was somewhat murky, especially close to shore, but we still managed to find some familiar fish. We ended up swimming nearly to the breakwater. Back in front of the condo, David and I snorkeled in the gentle shore break picking up little shells where the sand dropped off. I found a cowrie and a cone, both about an inch long, and a handful of others. It felt good to get out and do something. We'd arranged to meet Rob and BG at their place in Kihei at 5:30PM to view the sunset (and hopefully photograph the green flash) from their rooftop deck before dinner. I'd offered to bring salad and beer. We were late leaving the condo and the checkout line at Safeway was ridiculously long. Too late to get to the condo before sunset, we drove to a beachfront park just in time to hear the sunset-watchers applaud the green flash while we were getting out of the car. Rob and BG treated us to a wonderful dinner under the stars on the roof of their condo building. I helped Rob grill the fish fish and vegetables for supper, both so delicious that I regretted overindulging in the appetizers, which were also delicious - chips and guacamole from the farmer's market, marinated raw tuna, three cheeses and several kinds of crackers. We brought a fruit salad to accompany dinner, unaware that BG had prepared fruit salad for desert. It was OK - papaya, avacado and mango in Maui are a treat no matter how often they are served. Susan invited them to join us at the luau but Rob said they didn't generally do shows. He did try one of the beers we brought, a Green Lake Organic Pale Ale, but he preferred his Bud Light. We left fairly early because all of us were still somewhat jet-lagged. 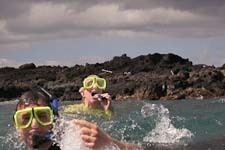 I had a bit of trouble at times following the conversation because my ears kept popping and gurgling due to snorkeling with my head cold. Eight years ago David and I hiked up the Kealaloloa Ridge above Maalaea but Daniel had been asleep when we left so we had gone without him. This time we made sure to include him, but having been up somewhat late the night before, we didn't leave the condo until almost 8AM. That was a mistake. The trail was already in the sun when we started up and the steep ascent up a fire road onto the ridge was much warmer than it would have been had we left at 6:30AM as I'd originally intended. We stopped twice to rest in shady spots but were soon dehydrated and enervated by the heat. The boys lagged farther and farther behind me but caught up when I detoured over to the saddle above Pu'u Ani to look down into the deep gorge east of the peak. hidden by the ferns. Crossing that, I found a waist-deep ditch about ten feet further along. At that point the ferns were up to my armpits and not liking the trend, we gave up. I worried that the "ditches" might be schrunds and that the next one would probably be deeper yet. About a quarter mile up the ridge the trail pulled right alongside the edge of the gorge and we got the view I had remembered from last time. It's a good one. Below us the slope plunges two or three thousand feet down into a gorge which drains into a narrow valley and on out to the ocean beyond. Kukui trees grow in pale green patches on the lower valley walls. Fluted green cliffs coated with scrub brush rise up to razor-sharp ridges which continue up into the clouds. The whole vast canyon is silent except for calls of birds and the soft hush of the wind. We gazed into the gorge for a long time and ate some lunch before starting down. Though we heard numerous bird calls in dense brush below us I wasn't able to spot any of them. We did flush a Short-eared Owl from Ohia trees near the overlook and spotted at least one White-tailed Tropicbird far below us in the gorge. No Nene in the meadows this time. As we were descending the meadow David spotted a man with a pickup down by one of the upper wind turbines. I doubt he noticed us. For supper we drove over to La Pinatas again. I had fish tacos this time and they were good. This morning we drove up the Haleakala Highway to Hosmer Grove, just inside the park boundary and about an hour from Maalaea, to join a naturalist-led walk into the Waikamoi forest preserve. Unlike last time, which was perhaps a decade ago, the birds were very active this morning. The drive up from Maalaea took less than an hour; I'd planned on almost two so we spenat a half hour at the national park visitor's center, where an unusually tame Pacific Golden-plover was patrolling the parking lot. uphill from us, mostly Amakihis, Apapanes and House Finches. The Amakihis are bright olive green and have a mewing call like a gnatcatcher. They forage for insects as well as nectar, reminding me somewhat of an orange-crowned warbler in their foraging habits, though perhaps a little more active. 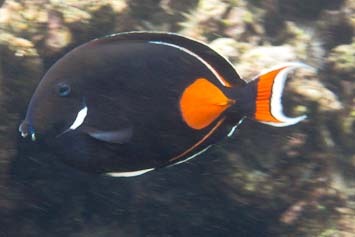 The Apapanes are red with black wings and white under the tail. Their calls include "chyeeet" and other more nasal scratchy notes; apparently they imitate other birds which makes voice identification more complicated. Their song, is the junco-like trill we kept hearing in the woods. I transliterated it as between "chreee chreee chreee chreee chreee" and "chyiee chyiee chyiee chyiee", sometimes sounding more like a yellow-rumped warbler than a junco, but I never spotted an Apapane actually singing it. They are very active birds, flitting rapidly around the Ohia trees and shrubs they prefer. On our walk Michelle led us down a road bulldozed through the non-native forest planted by forester Ralph Hosmer and others about a hundred years ago. Of the variety of trees he planted, several have thrived and even become invasive, including varieties of eucalyptus, Mexican weeping pine, western red cedar, a toxic Acadia from Australia and Sugi, a Japanese "pine" which David correctly noted was related to redwood. As we descended into a gully we began to see native trees and shrubs. Ohia lehua and Acacia koa were the dominant native trees. The Ohia has red flowers bristling with stamens, the primary food source for bright red I'iwi birds and Apapanes. The Koa has scimitar-shaped leaves which are actually modified stems; the finely pinnately-compound leaves fall off as they develop. Maui Honeycreepers forage for insects in the mossy lichens on the Koa branches. We saw all four species of native birds but not the Crested Honeycreeper or Maui Parrotbill which are seen occasionally on the tour. Rob had recommended the Paia Fish Market for lunch so we stopped there on the way down the mountain. The fish tacos were excellent. We sat at a communal table with a man in his 30's wearing a pork-pie hat and carrying a ukelele. The guitar was his usual instrument but he'd been working on the ukelele for about six months. I was curious what he did for a living but didn't want to ask, though I did find out that he'd been on Maui for seven years. 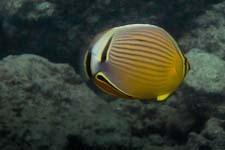 On the way home we stopped at Hawaii Photo in Kahului (at the start of the Hana Road, about a half mile towards downtown from the Airport road) and rented a Canon D10 with which we could take photos of fish underwater. I also rented a brand new 28-300 lens for David so he could photograph birds, since he didn't bring the 70-300.
stroll down the beach. Susan talked with Daniel while David and I walked ahead. I was hoping to catch the green flash again, which required a ten minute drive down to the north end of Kihei, but we didn't leave quite soon enough. The top of the sun's disk was just slipping below the horizon as we drove up to the beach. 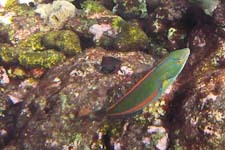 It vanished with the most spectacular green flash I can remember, richly colored and clearly visible without binoculars. At least we saw it, but I was quite frustrated that we weren't able to get there a minute earlier to photograph it. 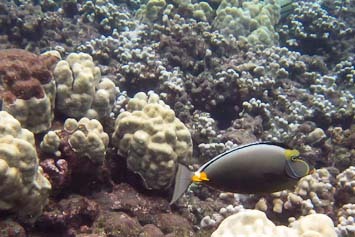 Great snorkeling today. 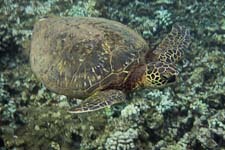 We spent an hour at Ahihi cove then drove down to La Perouse Bay at the end of the road and went out again. Both places were excellent. The camera worked remarkably well too. 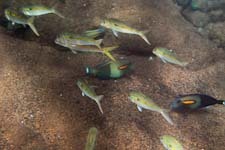 I was able to get photos of most of the fish that we saw, and once out of the water, we were able to identify almost all of them. 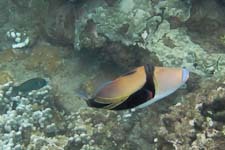 The book we used, Hawai'i's Fishes, A Guide for Snorkelers and Divers Second ediion by John P Hoover is by far the best and most complete guide to Hawaiian reef fish that I've found. 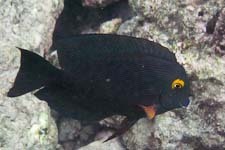 Not only did it have every fish we saw, but the photographs are excellent and are all accompanied by helpful notes. 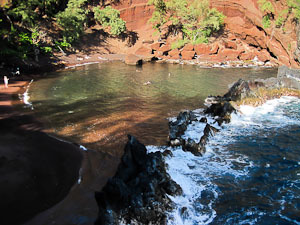 We entered the water at the north edge of the Ahihi Cove (where an underwater concrete boat ramp provides easy footing) swam across the cove towards the south. The water was murky where we first got in but cleared as we moved out of the cove. 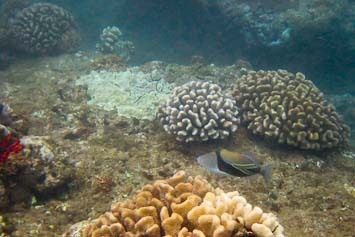 We didn't see big coral heads, probably since the lava flows which make up that portion of the coast are relatively recent, but the rocks were well covered with smaller corals. 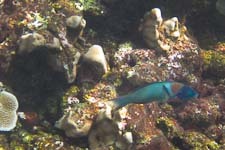 Fish weren't abundant but we saw more than 30 different kinds, and sea turtles as well. After an hour I felt that we'd seen about all we were going to see there so we located the boys and swam back to shore. between the rocks. 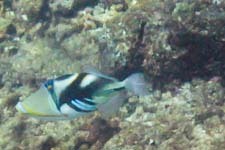 I could see yellow and convict tangs swimming in the clear water so I went in again and swam around a few minutes but didn't find much else. 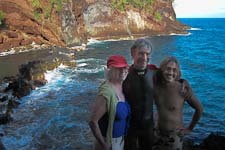 I climbed out onto the rocks again while Daniel and Susan paddled around the pool. 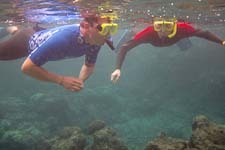 We did a little more snorkeling in the coves before heading back across the bay. The wind had picked up and the crossing was pretty rough. We bought lunch to go at Maui Taco and ate our tacos on a grassy lawn overlooking the water at a little park across the street. Java Sparrows were foraging under the palms - they seem to be more common this than during our last visit. At a glance their black caps and white faces remind me of chickadees. On the way home we hit a new farmer's market, this one by a little church on the ocean side of the main street in downtown Kihei. I spent some of our dwindling supply of cash on skinny purple eggplant and another papaya. Our mastercard card maxed out over the weekend so we've been spending cash instead until the payment I made online Sunday clears. We spent a quiet afternoon at the condo. I took the camera and tripod out to the beach and photographed sand crabs. 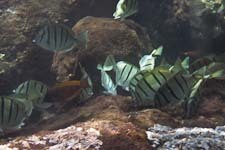 They excavate holes in the sand then park next to them, darting out to forage at the foam line as a wave begins to recede. Most were only an inch or so wide but we found a few holes the size of ping pong balls excavated by larger crabs which we never saw. Daniel built a dribble castle. Later in the afternoon we drove over to Costco so Susan could pick up a prescription. David and I chased Mynas around trying for photos and found a few feral cats in the parking lot. We made it back to North Kihei just in time to catch the sunset but unfortunately, there was no green flash this evening. After supper David and I photographed geckos around the light fixtures on the outside of the building. 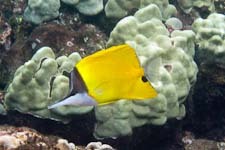 they had been in Ahihi Cove and often allowed us to get quite close. 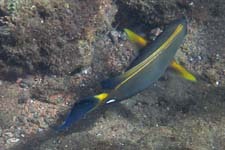 Unfortunately the battery went dead and I hadn't brought another but we got photos of quite a few fish first. David and I got cold and had to get out of the water for a while. 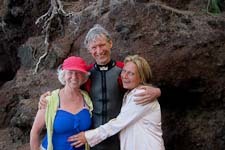 We stumbled over to a black (basalt) and white (coral) cobbly beach to get out of the wind and see what we could find. Someone had an old camp there with a fire circle and a tarp or old coat, I'm not sure which. No evidence of recent occupancy; the area is officially closed to entry from the land. I found a nice small cowry shell and several unbroken fragments of branched coral which I would like to have taken home but was afraid would tear a hole in my wetsuit. It was difficult to explore very far because A'a lava is tough on bare feet. I kept my socks on and quickly wore holes in them. Susan had suggested a couple of times that we invite Rob, BG and Marilyn over to our place for dinner, or perhaps just for hors d'oeuvres and drinks beforehand. I kept forgetting to email them but finally did so this morning before we left to go snorkeling. When we got out of the water we were hungry so we stopped a Maui Taco on the way home, then at the fruit stand to pick up more papayas but they didn't have any. By then it was getting close to 5PM, the time Rob would arrive if he was coming. I was surprised that he hadn't called, so I checked my phone and realized that I hadn't turned it on. Rob had called twice and they were on their way over. We arrived back at Hono Kai just ten minutes ahead of them. We shared papaya, pineapple and cheeses on the balcony then drove down to Wailea to watch a free luau show complete with hula dancing, coconut opening and a fire dance. David got called on to participate at one point and aquitted himself well. Afterwards we drove up the hill to Matteo's Pizza. We had a Vegetarian and a Greek pizza and both were delicious, especially the vegetarian one. 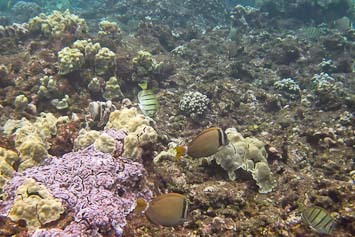 promised, the diversity of coral and fish was quite good. Photography wasn't; the water was for the most part too deep or too murky and the sun refused to emerge from behind the edge of a patch of stratocumulus overhead. 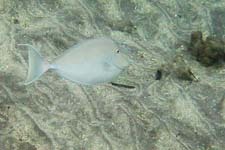 I did manage to get some half-decent photos of the Wedgetail Triggerfish (famous for its long Hawaiian name "Humuhumu Nukunuku A Pua'a") which had been too skittish for photos at our previous snorkeling sites, and Daniel photographed a Green Turtle. Returning to the condo around 10:30AM, the boys and I showered, changed and packed as fast as we could and managed to be out within a few minutes of 11AM. I talked with the housecleaners while Susan finished getting ready. They were trying to save money to go to Alaska where they hoped to get better-paying work. I suggested that they might find Alaska pretty chilly after Maui but they'd been there before. Their little boy hadn't; he'd be seeing snow for the first time. underwater camera before heading out to Hana but the boys were still interested in snorkeling and it wouldn't cost much to keep the gear a few more days, so we did. The afternoon drive to Hana was cloudy and uncrowded. We stopped at a couple of fruit stands but the prices were too high so we didn't buy anything. The farmers markets in Kihei had offered better quality and variety at lower prices, and we were bringing a fair amount of food with us. We did a couple of photo stops too but the light wasn't very good. Distracted by a fruit stand on the opposite side of the road, we missed our turn at Ulaino Road the first time we drove by. I recognized the road when we started down it - it was the place we'd bought a big bouquet of tropical flowers to take home four years ago. It was also the same road the boys and I and hiked down four years before that on our way to Blue Pool. Hana Botanical Garden is an inconspicuous driveway on the right about a mile down, across from another fruit stand. I'd come across them on the internet and had rented two studio apartments from a woman named Jo Loice. insulation packed between widely-spaced 2x10 joists and the wall studs were all exposed, making them feel rather like converted workshops. Only the window on the back wall, where the kitchen was, actually opened outdoors (though ours didn't open); the other windows faced covered porches so the rooms were fairly dark. At night they were even darker; the whole establishment runs on solar power so the lights are low voltage and fairly dim. When I first walked in I was afraid Susan wouldn't like it but I needn't have worried. She loved the seclusion and quiet in the daytime, and the deep darkness of the night, and didn't mind the threadbare look of the place. Though rustic, it was clean and that helped. For being in a tourist town the place was definitely secluded. During our entire stay we saw only one other car pull into our driveway and we felt no need to lock our doors; in fact, I don't know if we even had a key. The studios were at the end of the driveway, past Jo Loice's house, and were surrounded by tropical fruit trees - coconut palms, bananas, papayas, avacados, passionfruit and various other trees I couldn't identify. The trees didn't appear to be maintained but someone diligently mowed broad grassy paths through the woods. It could have been Jo Loice; she was on a riding mower when we arrived, though her health isn't good so I'm sure she has help. Daniel and David explored the neighborhood and brought back a couple of ripe papayas. I wandered around the mowed paths and found some passionfruit and several unripe but promising avacados to add to the several I'd picked up at one of the fruitstands on the Wainapanapa road. I fixed a fruit salad for supper. we went to bed early. trucks needed to turn around there. We doubted that but her advice on where to snokel was good. 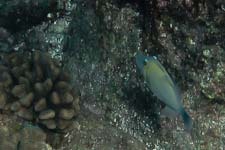 Around the pier we found more debris than coral or fish but beyond it was an extensive shallow reef with lots of fish. 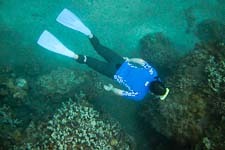 The water was reasonably clear and quite calm in the bay though considerably rougher out towards the point, beyond the shelter of the first big rock outcrops. After about 40 minutes I began to get cold then the sun came out and, absorbed in taking photos, I forgot all about being cold. 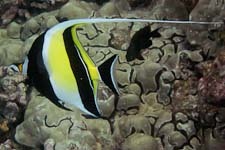 We saw lots of Convict Tangs and Whitebar Surgeonfish grazing on the reef. 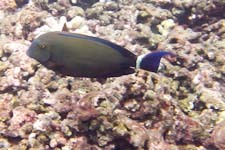 Other surgeonfish were common as well - Orangespine, Orangeband, Ringtail and Brown. 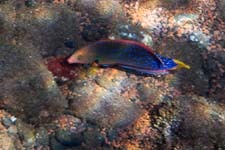 New fish included a colorful Belted Wrasse, a pallid-looking Bluespine Unicornfish and a Lagoon Triggerfish. 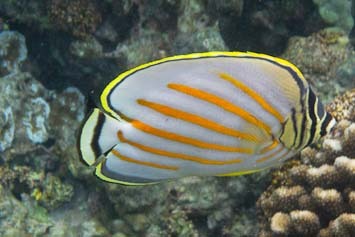 There weren't a lot of butterfly fish but we did see Oval, Longnose, Teardrop and Fourspot. While we were gone Susan walked down the road hoping to get to the shore. She ended up at meeting a young man named Ben, tall and slender with long hair and a thin beard, who had a place on the water. He showed her how he caught fish, by baiting a large hook with a chunk of meat and running it out at low tide on a cable strung out to an offshore rock. When the tide came in the meat would be submerged, and when it went out again a fish would be dangling from the hook. He said he caught big fish that way sometimes. Several other young people appeared to be staying at Ben's place, including a woman named Jessica with whom Susan talked about Jesus. Jessica had left her Bible in Kihei so Susan arranged to return and bring her another one. Ben told Susan he'd be cooking lunch at Uncle Bill's on the way into town and invited her to drop by later. That's how we ended up eating at Uncle Bill's instead of going out snorkeling again, which was OK because we'd had a fair amount of snorkeling already. The boys and I were hungry so we ate before we went out to Uncle Bills. Daniel and I had coffee and a few bites of the vegetarian pasta dish that Susan and David ordered. It was fairly good. Ben hung out and talked with us since the lunch business was slowing down. His interest in us seemed genuine but without warmth; I don't recall that he ever smiled. He explained that Uncle Bill opened up his certified kitchen to whomever wanted to use it. Different people in the community would sign up to fix and sell lunch, keeping what they made and leaving a little extra in the till for Bill. Ben did so a few times a month, when he felt like it or needed a little money. He seemed to be an anchor, or perhaps a host, for the loose community of transient young people hanging out in the area. He apparently held big parties down at his place, and people came and stayed as they pleased. Ben told us he worked from time to time as a concert promoter, arranging bookings for groups. He named a few but I didn't recognize them. There was a bluegrass concert this evening over in Kipahulu, he told us. Though not one of his bookings (I don't think), he was planning to go and invited us along. I was curious about how the different groups of people in Hana got along and he said everyone was pretty easy-going. That attitude seemed to apply to weed as well. As long as people were discrete about it the police didn't pay much attention. We also met Lucas there, sitting at a nearby table drinking one of the local IPA's from a sixpack in a paper bag at his feet. He was in his early 30's but looked ten years younger, with shaggy hair which framed his head like a cape and hadn't felt a brush in weeks. Originally from Ohio, he'd drifted onto Maui a few years ago, perhaps from one of the other islands, and was currently working at the Ono organic farm in Kipahulu cleaning banana groves and packing bananas. Apparently vines and dead leaves accumulate in the dense foliage of the banana groves and need to be cleared out periodically. One of the hazards of the work, he explained, was that rats occasionally fell off the huge leaves and onto your head. The farm ships out a ton of bananas and papayas several times a week to central Maui, along with a dozen other more exotic kinds of tropical fruit. For labor, the farm uses a rotating coterie of interns which, Lucas noted, currently included several hot young women. Workers signed up for a six-month stint on the farm and in turn for working 40 hours a week in the orchards and at the fruit stand in town, learned different aspects of the farm operations and received room and board along with a $100/week stipend. We'd hoped to get over to Kipahulu in the afternoon to hike up to the bamboo forest but we had to go shopping first since the store might be closed by the time we got back. Unfortunately by the time we got home it was too late to do the hike. For supper I fixed rice and vegetables using the skinny little eggplants I bought a few days ago in Kihei. It turned out surprisingly well. I also made a pancake out of the ripe breadfruit I'd bought at the Ono farm stand. To prepare the breadfruit I first sliced off the coarse green skin. Though I oiled the knife first to facilitate cleaning off the gummy latex afterwards, there was no latex; that precaution must apply only to unripe fruit. The interior of the breadfruit consisted of mushy-soft pale green flesh with a fibrous texture surrounding a large spindle-shaped seed in the center. It quickly turned brown on exposure to air, like avacado only faster. Perhaps it was only the name, but both the fragrance and the texture of the flesh reminded me of bread dough as I stirred it before putting it in the pan. I spread it out thinly in a buttered non-stick pan and fried it as slowly as I could over a gas burner. In the pan it smelled like a pancake with a hint of cinnamon. When it was firm enough I flipped it, and judged it done when it was no longer gooey in the middle. It tasted more like sweet potato than pancake but was quite good with Susan's lilikoi jam. The boys were getting ready for bed when we left for Kipahulu. I envied them. When we arrived a band named Conjugal Visit was playing. They weren't bluegrass, which was just as well in my opinion. I found the sax player's lines particularly satisfying. The center of the pavilion, in front of the band, was cleared for dancing and several of the dancers were quite good, a muscular dark-skinned man wearing only shorts and a tall thin young woman who turned out to be the fiddler for the next group. Picnic tables were arrayed around the dance floor and some people were eating. The food for sale included tasty-looking vegetarian plates but we were full. The crowd was seemed to be mostly local residents, a mix of Hawaiians, haoles and hippies. There were a few older men and women but no other tourists. We wandered around looking for Ben but never found him, though we did see Lucas, and one of his coworkers named Lindsay from whom I'd bought the breadfruit. When I told her about the pancake I had the impression I was the first person she'd ever talked with who'd actually eaten breadfruit. Lucas danced with Lindsay some, and Susan and I danced for a half hour or so to the headliner band. They were a little too loud and in my opinion, not as good as the first band, but the music had a strong beat, good for dancing. We left by 10PM and gave Lucas and Lindsay a ride up to the Ono farm on the way home. The boys and I hiked up to Paliku cabin on the Kaupo trail today. Susan drove us over from Hana. The drive over took an hour and a half. Beyond Kipahulu the road is gravel in places and rough and narrow almost everywhere, cut into dramatic cliffs above the water. With a stop to photograph a waterfall on the way and time getting ready at the trailhead, we didn't start until after 9AM. We thought maybe Susan would drive back to Hana for the day but she stayed in Kaupo instead, waiting for us at the trailhead and down at the store. She had a good day and we had a good hike. 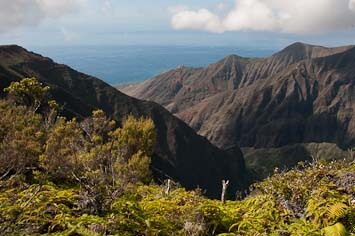 The Kaupo trail runs up the east side of an old a'a lava flow which descended from the Haleakala summit rift and partially filled the Kaupo Gap some 120,000 years ago. The terrain consists of vertically- aligned furrows and ridges lightly eroded and blanketed with a veneer of soil. Above the national park boundary at around 4000' and continuing up above 6000' a scrubland composed mostly of native shrubs is the dominant habitat with scattered meadows and stands of low A'ali'i, Ohia, Koa and Mamane trees. Outside the park goats and cattle have devoured the native woody plants leaving pasture in the upper reaches interspersed with groves of invasive trees, mostly Christmasberry, at lower elevations. We missed the road to the trailhead at first. It's a narrow track which starts up the hill just east of the Kaupo store and climbs about a mile and a half to the trailhead at 1100'. The first mile or so of the trail follows jeep tracks in and out of the trees. The next couple of miles climb steadily through rocky pastureland of coarse bright-green grass dotted with black boulders and outcrops of basalt. The goats and cattle keep the grass grazed smooth but not necessarily short. In places it forms an elevated mat which conceals rough ground underneath but where the grass was cropped short in the jeep tracks the walking was easy. Where we first came out into the pastureland we stopped for a break and exploring, I stumbled across an enormous bull hiding in the shadows under some pepper trees. Fortunately he was not aggressive. Farther up the hill we flushed herds of goats, big shaggy brown and gray animals with long curved or spiraling horns. The weather was beautiful, sunny and mostly clear with a breeze most of the time, but hot hiking just the same. Guava bushes were common along the way. Most had only flowers or small green fruit but a few bore ripe fruits, yellowish and soft with pink flesh full of hard round seeds. The flavor is somewhat like a tart strawberry, more appetizing on a hot trail than back at home. After hiking for a couple of hours we stopped for a lunch on a breezy ridge at 3200' overlooking a small gorge. We each had a sandwich and some of the papaya I chopped up this morning. The papaya was incredibly satisfying. Clinging to the far wall of the gorge was a yellow-flowered Ohia in bloom - the first native plant I recognized on our hike. Not far above that we began to pass broad stout Koa trees with their gray-green leaves shaped like crescent moons. A ridge began to rise up on our right. I didn't have the 300mm lens attached. I put it on after that. Daniel pointed out a distant red bird so I photographed it, and it turned out to be an I'iwi. Above that the trail ran along the edge of a small gorge at the foot of the high ridge on the east side of the gap. The gorge originated at the foot of a dry waterfall several hundred feet high. Numerous small birds were flitting between mature Ohia trees in and above the gorge. The mystery bird was singing there too. Daniel and I managed to get a few Amakihi photos and I eventually identified some of the others as Apapanes and Japanese White-eyes. The long break at the gorge put us behind schedule and we didn't reach the cabin until almost 3PM. Nene were awaiting us. We photographed them and ate another lunch sitting on the grass out front while a pair of Nene nibbled around us. Fifty yards away from us a young woman was setting up her tent in the shade of a tall shrub; otherwise the area was deserted. 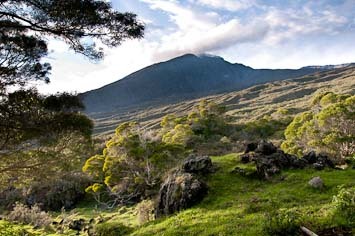 The cabin sits at the foot of a scrubby cliff at the east edge of the Haleakala "crater", framed by a few good-sized Mamane and Ohia trees and overlooking a gently sloping meadow. The front door was locked. Peering in the window I saw a dozen bunks and two tables, spare but well-kept. Out front is a square stone turret with a water spigot on one side and a chipped enamel catch-basin underneath it. As we finished lunch one of the Nene sat down in the basin and attempted to bathe. They probably don't get much opportunity for that in their natural habitat. We hurried on the way down but also made a few photo stops. As the sun dropped near to the horizon the green grass of the meadows took on a particularly rich hue. Susan was waiting for us at the car. We'd been able to call her about an hour earlier so she wasn't worried for us. The sunset was stunning. On the way back to Kipahulu we passed more than a dozen cars coming the other way, most of them filled with young men headed for a party at the sprawling house by the Kaupo trailhead. For supper we found wood-oven fired pizza at the fruit stand near Ulaino Road, as Ben had recommended. Lucas and Jessica were both there, along with a motley crew of local stoners. Despite being out of some ingredients, the cooks fixed up some delicious pizza for about $15 a pie. 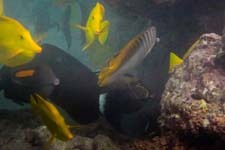 different species seemed to circulate through. Shallow water, sunshine and little wave action made good conditions for photography and I took lots of pictures. Susan swam with me outside the cove and across the little bay to a shallow area among the rocks but the water was too turbulent for her. Swells rebounding off the basalt wall made the bay crossing pretty rough. She was getting too tired so I took her hand and pulled her through the channel and into the shelter of the cove again, where she was able to swim to the beach. I swam back out to join the boys out where the swells were breaking on a point of the cliff. David tried to photograph the waves but the light was too bright so we swam across the bay to where swells were cresting over a shallow ledge. 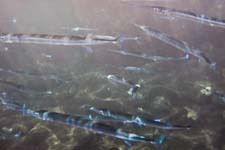 I photographed fish while the boys tried to ride the breaking waves but eventually I got cold and had to go in. that so Jessica apparently caught a ride with Travis. 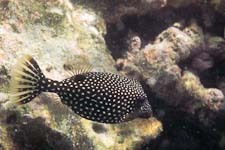 He had promised to take Jessica snorkeling but went out without her. She seemed content to stay on the beach anyhow. On his way down to the water he told us not to use fins and warned us not to go out of the cove. A few minutes later he came by again and told us we could go out if we wanted to. Lucas and Jessica ended up coming back to our place with us. Daniel and I fixed rice and stir-fried vegetables, and breadfruit-banana pancakes. We had lots to eat because we cooked for six guests but no-one was at Ben's place so only Lucas and Jessica came for dinner. They spent much of the time sitting close together talking on the back porch like teenagers on their first date. After dinner Susan took them both back to Ono Ranch, after first writing a long letter of recommendation. We're hoping that Jessica can stay with Lucas at the ranch and work there, giving her a chance to get settled and figure out what to do next. Everyone enjoyed the breadfruit pancakes but I thought the ones without bananas were better. One apple banana per breadfruit might be OK but I used four, which made the pancakes gooey and sticky. When I stopped over at Jo Loice's house to tell her we were leaving in the morning, I told her about them and she explained how she prepares unripe breadfruit. She boils them whole in a big pot of water for 10-15 minutes then cuts them in half and cooks them until they are tender, like a boiled potato. 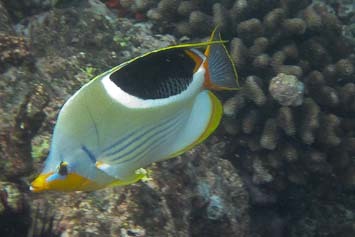 After peeling off the skin she slices or cubes the flesh and serves it as is or saves it to fry or reheat later. We'll have to try that on our next visit to Maui. ripe avacados. A few miles beyond Kaupo we came across an old Catholic church and stopped for lunch in the churchyard. Above us a cloudbank filled the Kaupo Gap - apparently we were fortunate to get sunshine all day when we hiked up there. basalt headlands with occasional steep bouldery beaches. After about ten miles the terrain changes again and grassland is replaced by newer A'a lava flows with shrubs and stout yellow wiliwili trees growing in the hollows. As we rounded the southwest ridge of Haleakala we could see La Perouse Bay and lava flows of Cape Kinau, where we were snorkeling last week, 3000' below us. 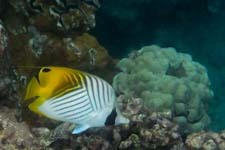 We reached Kahului around 1:15PM, returned the camera and lens to Hawaii Photo and drove over to Kihei to return the snorkeling gear to Snorkel Bobs. After repacking our suitcases in a parking lot somewhere in North Kihei we drove back to the airport. Our flight was delayed a bit so we had time for some more lunch, leftover rice and stir-fried vegetables with breadfruit-banana pancakes, before we boarded. The flight passed quickly but the weather in Seattle was a shock, 32F and snowing. We had about 3" of new snow on top of a couple of inches of old snow at our house so I had the Shuttle Express driver drop us off at the foot of the driveway. Welcome home! We lost our power yesterday evening around 10:30PM but when I woke up at 3:30AM the lights were back on. 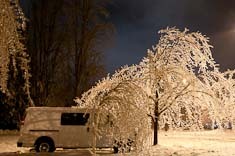 Losing power was no surprise since the snow yesterday morning changed over to freezing drizzle around noon and by evening the trees were pretty well encased in ice. Before the rain we'd received about five inches of snow on top of the three inches or so already on the ground. 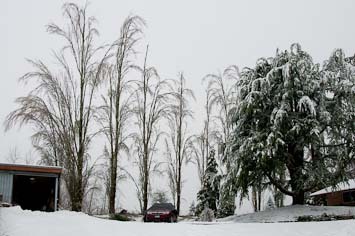 According to the weather forecast, the freezing rain was supposed to be confined to southwestern Washington; too bad they were wrong about that. The power went out again around 8:30 this morning, a good reason to finally unpack the generator we bought a year ago. 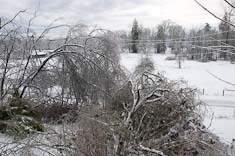 With tree limbs cracking and ice showering down several times a minute from trees all around the house it didn't look as though power would be coming on any time soon. About a half inch oc ice has accumulated on weeds and trees alike. The weeds are bearing up better than the trees under the load. The poplars are faring the worst. 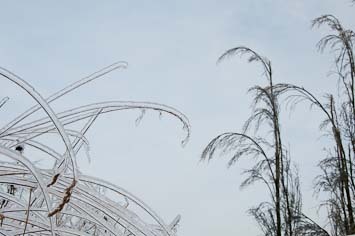 Half of their normally upright branches have already fallen and the rest are bent over like weeping willows. Every few minutes while I was working on the generator in the carport, another limb would snap sending twigs and ice skittering across the icy snow on the driveway. Around 3PM, some twenty years after we had our generator sub-panel installed, we finally had a generator hooked up to it. Unfortunately we had no gas. 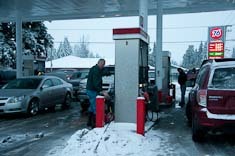 The gas station at Brown's Corner was open and guys in pickup trucks were lined up waiting to fill five gallon containers with gas. We took our turn then called Rainier Grill to see if they were open. They were, and when we arrived at 5PM they were full. I walked around the block taking photos while we waited. The ornamental trees along the streets glittered in the lights. When our table came up we offered to share it with the next party in line. Michael and Mike, father and son from Maryland, had just flown in with plans to ski up at Crystal Mountain for a few days, except that hwy 410 was closed. We offered them the boys' rooms in case all the motel rooms in Enumclaw were full. Back at home we filled up the generator gas tank and got the lights on. Mike called an hour or so later offering to let us use their motel room to take showers but we were already all cozy and settled in the den with the lights on and the stove pouring out heat. We stayed home. In the evening after I had the generator running I was talking to Daniel on the phone and descending the stairs to the basement in my fleece socks when I slipped and fell hard. I slid all the way down the stairs on my lower back. Susan told me later that it sounded as though I'd dropped a load of firewood on the stairs. It hurt like nothing I've experienced in a long time, an excruciating stinging sensation throbbing somewhere above my pelvic bone on the left side. I stumbled into the schoolroom yelling and swearing, with Daniel still on the phone. Susan came running and helped me into the den where I lay down on my stomach on the carpet, woozy from the pain. As I lay still the stinging subsided to a tolerable level. Any attempt to move triggered it again so I lay there for about ten minutes before gingerly trying to get up on my hands and knees. After a couple of tries I made it but still felt as though I might pass out. Moving the wrong way would immediately bring back the pain. To my surprise though, after about a half hour I was able to stand up and walk around, carefully. I even managed to brush my teeth before crawling into bed. David and I went out this morning to GogLeHiTe Natural Area in Tacoma to take photos of birds. We'd planned to go to church afterwards but didn't make it. Instead we drove over to Metropolitan Market and sampled cheeses, then bought a couple of sandwiches and a salad for lunch. We planned to have a picnic at Titlow Park on the Narrows south of the bridge but couldn't wait that long so ate in the car before leaving the Metropolitan Market parking lot. I didn't think I'd gotten any good photos at GogLeHiTe and was feeling frustrated with the long lens, in part because I couldn't figure out how to use the memory recall feature. My main complaint is that when the autofocus misses its target, it runs all the way to the closest focus point then won't attempt to refocus again on a distant point. I wanted to use memory recall to rest the focus to about a hundred feet, from which point the autofocus will readily refocus longer or shorter, but I couldn't figure out how to set the focus memory point. I probably should have read the instructions long ago, but never did. We did somewhat better at Titlow Park. 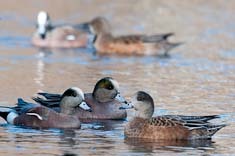 In the two saltwater ponds we found a small flock of gulls, mostly Glaucous-winged and Mew with an adult Western as well, and a larger flock of American Wigeon with three Eurasian males among them. 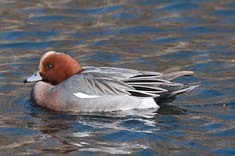 David took some good gull photos and I got my first Eurasian Wigeon photos. Susan called and told us she'd like to come join us so I gave her directions. While we waited, David and I walked along the narrow beach north of the piers that are across the railroad tracks from the south end of the park. The afternoon was clear and sunny and fairly comfortable for February. We were just coming back when Susan called to let us know she'd arrived. We hung out on the piers while she talked with some divers we'd seen offshore earlier. 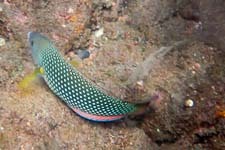 They told us that the pilings offshore hosted a colorful variety of invertebrates including large anemonies and bright orange and yellow nudibranchs. One of the men was a dive instructor and gave me his card. He told me it would cost about $400 to learn to dive in his classes. 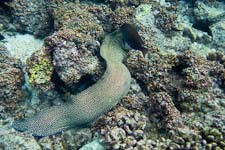 For photos, diving can be better than snorkeling because you can stay underwater and while the fish grow accustomed to you. His outfit is Seattle School of Diving at 206-681-7827. 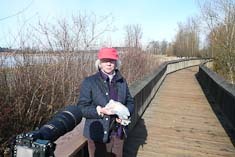 Susan and I drove down to Nisqually for an afternoon of birding today. We'd planned to join Shep Thorpe's Wednesday morning group but didn't arrive until after they were done. At the visitor's center we were surprised to meet Susan Boyington, the mother of a friend of Daniel's at Charles Wright. We didn't know she was a birder. 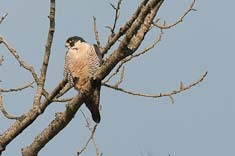 We were also pleased to discover that the female peregrine which I photographed in flight and in the big cottonwood by the corner of the parking area back in October was still present in the same tree. Susan had been birding all morning so didn't join us but maybe we'll get together another time. We ate lunch on the boardwalk along the slough north of the visitor's center. The sun was shining and the air not too chilly and Susan was delighted to be out. I carried the big lens and the heavy duty tripod and got lots of use out of both. BTW, I read the manual on the long lens and figured out how to save and recall an autofocus setting, and it proved quite helpful today. After a stop at the barns (Susan loves old barns), we walked out on the dike to view the baby owls reported in a hollow cottonwood and got distracted by a Marsh Wren calling in the matted grass right below us. For a half hour we hung out there while I tried to get a photo of the wren but it wouldn't fully emerge from the cover of the grass. Finally as we were about to leave, it popped out into the sunshine. For once I was ready and got half a dozen sharp photos in the ten seconds or so before it dove into the grass again. 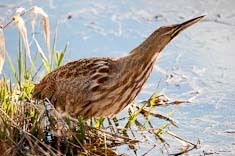 An even better surprise was awaiting us a hundred yards down the dike - my first American Bittern in years. 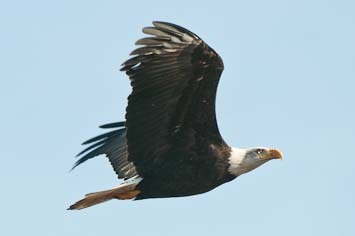 It was posing in full view right at the foot of the dike, at the edge of the big freshwater marsh-pond. I took a ton of photos while it alternately posed and skulked through the grass. 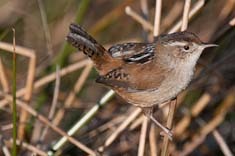 Despite being somewhat backlit its plumage was beautiful, a complex pattern of streaks and bars in various shades of rich brown and beige. 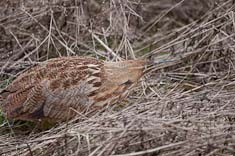 We delighted in watching it move ever so deliberately through the grass, with a curious habit of swaying gently as if it were stirred by a soft breeze. We must have pointed it out to a dozen people walking by while we watched and photographed it - definitely a highlight of the day. I finally had a good run today - 13 miles with no significant IT band soreness. The outside of my left heel, which had been sore by the end of the day at Nisqually, was OK as well. Both the heel and the IT band problems are left over from my fall down the steps a month ago during the power outage. I've been concerned that I might not recover in time for Boston, but now it looks as though I'll be OK, and may even be able to do the Gorge Waterfalls 50K in five weeks. After the first mile today I ran 10 at 9:15/mile with no stops and felt good most of the way, though a little stiff towards the end. Without getting out for marathons, it's been a pretty uneventful month since we returned from Maui. I've been working on photos and on this journal quite a bit but haven't gotten around to the Maniac programming work. Susan hasn't been getting out much either - it's as if we've been hibernating through the gray days and wet weather of winter. This winter has seen one of the larger Snowy Owl irruptions on record, at least in the Midwest where they're wintering as far south as Missouri and Texas. Here in the Pacific Northwest they're concentrated at Damon Point in Ocean Shores and around Boundary Bay just across the border in British Columbia. I've been intending to get out and see them and this afternoon, Susan and I finally did so. We left around noon and reached Ocean Shores at 3PM. Even as late as it was on a weekday, a dozen or more cars were parked along Marine View Drive at Damon Point. The map shows a road out to the point but it apparently washed away in a storm a few years ago so it's now about a mile and a quarter walk along the beach out to the area of the sand spit where the owls are roosting. Finding them was easy - each group of owls (they apparently don't mind company) was being monitored by one or more photographers. We joined the biggest crowd, a half-dozen people with lenses long and short trained on three Snowy Owls sitting on driftwood out in the dune grass. 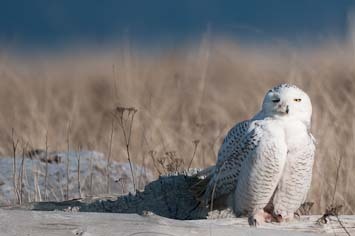 Watching Snowy Owls is a peaceful pastime. The sun was shining for a change and the winds were light so even my hands stayed warm. Susan watched the owls for a few minutes then sat down in the grass with her back to them, facing the sunshine. 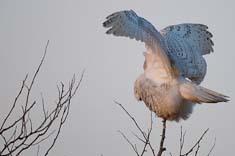 I set up my tripod and lens next to three or four other photographers and peered through my lens at the owls. They mostly just sat there with their eyes closed as if squinting in the sunlight. One was panting, fluttering its throat to cool off. For them 40F at Ocean Shores must be like 85F on the beach in Maui is for us. 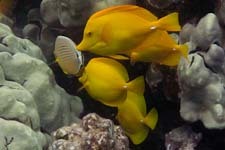 Occasionally one would preen for a while, or open its bright yellow eyes and look around. People for the most part took care not to disturb the birds and for their part, they didn't seem to pay any attention to us. During the half hour or so that I watched those first three birds, they stayed put though the photographers moved around a bit, trying for a new angle or better light. 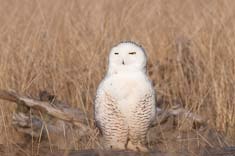 After I'd taken at least a hundred photos, Susan and I moved over to another group of owls, two of them on a couple of logs in the dune grass. Two women were crouched behind more driftwood about thirty yards from the owls so we joined them. One owl was heavily barred which usually indicates a juvenile; the other was much paler, perhaps an adult. Within a half hour after we arrived, the adult flew up into a bare tree even closer to us than he'd been before. I took lots of photos, especially when it flapped its wings while trying to get a better grip on the branch. About an hour before sunset the owls began to leave their roosting places and fly off towards the trees a few hundred yards away. A fifth owl flew by us from farther out on the point, then the juvenile took off. For us the sun slipped behind the leading edge of a cloud layer coming in from the west but the Olympics were still illuminated when the adult moved to a bigger dead tree at about 5:30PM. For us and the remaining photographers, that meant it was time to head home. Fish Shack so we told him we'd try it. On the way back into town I spotted an owl sitting on the phone wire along Ocean Shores Blvd. It was too dark to see anything but the bird's silhouette but with Susan's encouragement we turned back and pulled off the road so I could put the camera on the tripod and try for a photo. Susan maneuvered the car so that the owl received a little extra light from the headlamps. The exposure was two seconds even at ISO 800 but the owl stayed very still so I was able to get a reasonably sharp image. Back in town we couldn't find Bennet's Fish Shack. A restaurant named Alec's By the Sea was occupying the address where my phone map said Bennet's Fish Shack should be, so we ate there instead. The place was clean, the service quick, the prices reasonable and the food quite good - we'd definitely go there again. 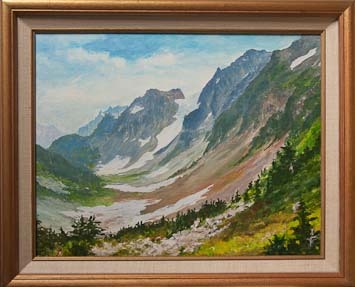 I took up painting yesterday and completed the acrylic of Pelton Basin that I started two years ago. 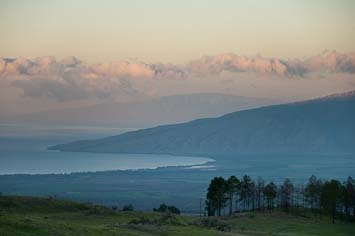 Everything below and to the right of the line of trees which starts in the lower left corner is new - the foreground and middle-ground. I think it turned out well, especially considering that foregrounds have typically been my weak point. Today I started the owls and worked perhaps six hours on them. I thought maybe it might be too difficult for me at this point - not only the freehand drawing of the owls but also the extensive foreground textures of grass and logs. So far it's turning out different than I expected - more texture, less detail. The small log was easy so I thought the big log would be too, but the best I could do so far was create a ledge. Since there are no ledges at Ocean Shores, I plan to redo it tomorrow. And the owls. The middle and background grass areas need work too. Still plenty of challenges left. Our big achievement yesterday was finding Susan's charm bracelet. It had been missing since before Christmas and Susan was very concerned that it might have been lost forever. It was her mother's, and irreplaceable. I'd already searched my car but Susan suggested that we look again and there it was, sitting in plain sight under the passenger seat. I'm sure it wasn't there when I looked before; maybe it was a miracle. In any case, it was as if a great weight had been lifted off Susan. Perhaps that's what gave me the initiative to start painting again. I worked on the owls again today, my sixth day of painting on them. 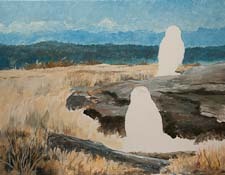 I figure I've worked about 24 hours on them so far, more than I'd hoped to spend but not unreasonable considering the complexity of the subject. The two owls alone took almost half that time. I added the stub on the left today. It changed the whole feeling of the painting, serving as a counter-balance to the two owls and tying the composition together. Here's what it looked like before the change to the logs. 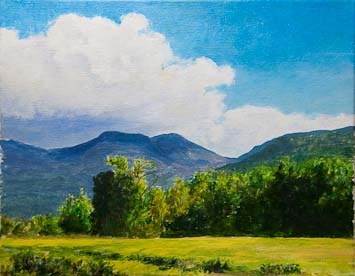 I reworked the nearer line of hills too; I painted them with Pthalo Blue the first time around but have been using Ultramarine Blue in the painting since, so the hills no longer fit. They were too dark too. 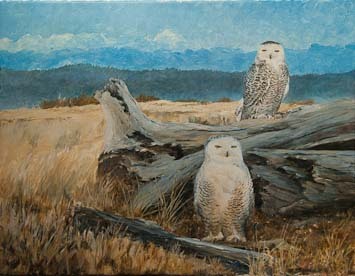 David wants me to smooth out the sky and the distant mountains, and now that the owls are done, I agree with him. Susan suggested that I trim off the section of the log to the left of the lower owl and I agree - despite several tries I wasn't able to make that part of the log work. With those two changes, and a little refining of the background dune grass, I think the painting will be about done. I'm really happy with how it has turned out. Hopefully it isn't just beginner's luck. I was talking to Ed the other day and he lamented that his early paintings wore no worse, and several cases were better, than almost all of his subsequent work. I don't think that was true for me when I was painting after college; I think several of my later paintings were the better than anything I'd done before. I think I fell into a compulsion to paint too much detail when I was painting before, and I'm hoping I can avoid that trap this time. I've given up hope of running the Gorge Waterfalls next weekend. My right knee is still stiff and swollen from sking up at Crystal with David three days ago. Though we didn't get there until 1:30, we skied hard and accumulated about 16K feet, much of it in deep but chopped-up powder, tough going. Skiing was more fun than I remembered - I don't know when I did it last, but it must have been at least a dozen years ago. Unfortunately running marathons doesn't condition you for skiing. I think (and hope) my knee problem is just a severe case of DOMS in the Vastus medialus and the muscle in the corresponding position on the outside of the knee. Both are swollen and soft, and the edema has extended down on both sides of the knee. There's essentially no pain though, which is odd, but which I hope indicates that I didn't tear anything. I had a similar problem for a few days last week after jogging back to the car from Damon Point with my camera, lens, spotting scope and tripod. My pack weighed at least twenty pounds and the sand was generally pretty soft on the beach, so I adjusted my gait to land flat-footed and slide my foot back rather than pushing off my toes. I noticed I couldn't kneel on my right knee; the leg would only bend about 120 degrees, but I didn't take the trouble to analyze what the problem was. This time my knee is much more swollen; bending 90 degrees is difficult. The knee troubles, along with a bad head cold last week, have kept me from running for about ten days now. Hopefully I'll still be able to run Yakima Canyon at the end of the month, and Boston exactly a month from today. 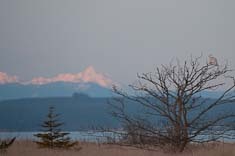 Susan and I had a nice overnight birding trip back to Ocean Shores last week. We stayed at the spare but clean Oasis Motel for only $55 including tax and ate at Bennett's this time. It was good but I preferred the more expensive dinner at Alec's. 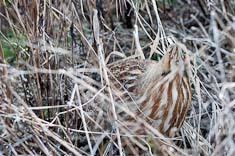 We hiked out to the tip of Damon Point and I got a few more owl photos, along with shots of Western Grebes and a Common Loon foraging in the tidal rips just off the point. And the female King Eider, a life bird, though unfortunatly not very close. On the way back I waited for the sunset but distant clouds blocked the green flash. The moon was rising though, and I found an owl on a tall stump and photographed it framed by the full moon, kind of a cool shot. Susan was tired in the morning so she slept in while I dragged myself back out to the point, then over to the jetty, despite a continuously runny nose and a stiff southeasterly breeze. Bad combination, that. Fortunately I brought my new lens cover so the camera and lens stayed dry. I missed a few good flight shots due more to my gloves than the lens cover, but did OK overall, particularly with a pair of Sanderlings on the beach by the jetty. Later in the afternoon Susan and I returned to the jetty where I found the Rock Sandpipers and Black Turnstones I'd been looking for in the morning. A good trip overall. 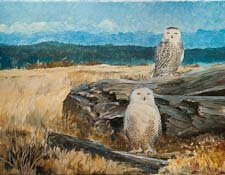 I worked for five or six hours on the Damon Point Snowy Owls today and finished them. 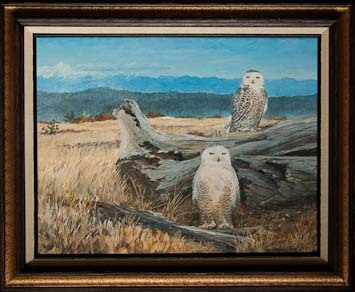 I didn't change the owls other than to make a few changes around their feet to help ground them but I repainted the sky and the mountains and truncated the log to the left of the lower owl, changes suggested by David and Susan respectively. I also finished up the background and middle-ground grass. Overall I'm quite happy with it, in fact I feel a bit intimidated because it sets a high bar for my next painting. The frame is a little too bold but the price was right; it's a stock frame from Blick's and cost me about $16. A note on my palette - I ended up using mostly Ultramarine Blue, Raw Umber and Yellow Ochre, along with Titanium White, of course. The sky has more Thalo Blue than Ultramarine, and there's a fair amount of Burnt Sienna as well as some Orange (Quinacridone?) in the foreground and some in the logs. I used a little of both Hansa Yellows, but not much, for highlights in the grass and a bit of Sap Green for the tree in the left background. Thalo Blue and Red in the middle mountains came out too intense so I scumbled them with Ultramarine Blue and White, if I remember right. The owls are shaded with Ultramarine Blue and Yellow Ochre (I think), with Raw Umber making up the bulk of the dark markings. The swelling around my knee doesn't seem to be going down much but walking feels almost normal now so it must be improving a little. Perhaps I'll try running tomorrow. I read up a little on ACL injuries and apparently they tend to prevent full extension of the knee. Now that the swelling has diminished some, I am able to fully extend my knee, so hopefully that isn't the problem. Diagnosis will probably require an MRI for which Enumclaw Hospital charges about $5000, but fortunately there are a few websites which enable comparison shopping for MRI's, and I may be able to get one for as little as $700. Or I could fly to England and pay half that much. Might be worth it. We spent this evening with Vo and Sonya. Mai was home early on break so David came with us. Vo fixed Chickpeas (Indian), Tofu w/ pickled mustard (Vietnamese) and Eggplant and beans (Chinese) and Sonya braised Alaskan Weathervane scallops they'd purchased at the Charles Wright auction a week ago. The scallops were among the best I've ever had, and the vegetarian entrees were delicious too, especially the tofu w/ pickled mustard greens. It was a very pleasant visit. We opened registration for the 2012 Light at the End of the Tunnel marathon today. I'd promised a 10:00AM opening but forgot about it last night so didn't get the link up until noon. By the time I logged in around 11:00AM half a dozen people had already emailed me to remind me. This evening we have already received 92 entries, so we are one quarter full. Based on that, I'm going to go out on a limb and predict that the race will fill by the end of May. On jury duty for the past two days, I got excused from the jury pool for the first trial that came up; I was added to the pool for a second trial which was subsequently canceled; I was bypassed for the pool for a third trial, then at 3PM on my second and last day of service I was added to the pool of potential jurors for a fourth trial, a criminal trial which could last for three weeks. I need to return on Monday for jury selection. Fourteen jurors will be selected out of the 35 in the pool, so I figure I have about even odds of ending up on the jury. Could be interesting, though the process could be pretty tedious too. After 96 hours, we have 160 entries for the Light at the End of the Tunnel marathon, 40% of the total we're planning to allow to sign up. Thirty of the registrations were from the 55 people who've contacted me over the past year asking about the marathon, and whom I emailed ten days ago, a week before registration opened. Another thirty or so either ran or signed up for the race last year. That means that 100 of the people who've signed up so far this year are new to the Tunnel Marathon, having discovered it presumably by word of mouth or through Marathon Guide or the Maniacs, the only two places that I know of where the marathon is listed. Today I spent about six hours setting up and sending an email to the rest of last year's runners who haven't yet signed up or received notification of registration opening - about 280 people altogether. I'd promised sometime last year that I would email them when registration opened. It will be interesting to see how many more registrations we pick up from that group; my guess would be somewhere between 50 and 100 over the next week. I'm now expecting the marathon to fill by the end of April. I was signed up to run the Gorge Waterfalls 50K today but I've only run two days, and a total of four miles, in the past three weeks thanks to a bad cold and my swollen knee, which is now almost fully recovered. A few days ago I called Jeff P, having not talked with him in a while, and he mentioned he was running Mercer Island with his daughter Katie. Having concluded that I wouldn't be able to handle the 50K I signed up for Mercer Island instead. I met Jeff and Katie before the start and we ran the whole distance together, the first half at about 9:15 and the second at closer to 10:00. I started feeling pretty stiff around mile 10 so was glad I didn't try for the longer distance. Jeff did, tacking on another 8-9 miles after the race. I went home to their apartment with Anita and we sat and talked for an hour or so while we waited for Jeff to get home. They've downsized from their house to an apartment while having their house remodeled, but now are thinking that they won't return to the house after all. Both of them found the remodeling process very difficult. The general contractor proved incompetent if not actually crooked so they've hired an architect to oversee the job. Downsizing has been difficult too, particularly for Anita. We found that we have the same temperment regarding posessions - we're both collectors. We attach memories and affections to the things in our lives so find it painful and depressing to discard them. Unlike me, Anita doesn't have other collectors in her family so she doesn't get alot of sympathy. She talked some about her own family - her parents and siblings. Her fraternal twin was her mother's favorite - and things more or less went downhill from there. She turned out pretty well, considering. I'm on the jury but court doesn't meet on Fridays and we had yesterday off, so I did this painting. I intentionally tried to stay loose and work quickly but it took a while to work out the sky and clouds, probably 4 hours there and about 10 altogether. The sky is mostly Thalo Blue with a little Ultramarine Blue and Titanium White, the same as for the owls but less Ultramarine. I also brushed in a little Hansa Yellow Light here and there. For the clouds and the blue of the mountains I mixed a little Quinacridone Violet into Thalo Blue and lots of White, adding a little Burnt Umber in the dark areas and a touch of Hansa Yellow Medium (or Dark?) in the lighter areas. Later I touched up the shaded portion with a little Ultramarine Blue mixed with white because it seemed too pale. The clouds still need more shading but won't get it because I don't want to invest more time in this painting. Wildcat Mountain is done with the same colors, along with Hansa Yellow Light in the lower portions to provide the green tones. The nearer mountain on the left is also a mix of Thalo Blue, Quinacridone Violet and Hansa Yellow Light, with a subsequent wash of Ultramarine Blue and White because my initial pass was too green. I initially washed the field with Sap Green and Hansa Yellow Light then realized that what I needed was almost pure Hansa Yellow Light, with a touch of White and Burnt Sienna on the right side. The dark area in the trees was an initial wash of Burnt Sienna and Sap Green; I liked the transparency but it was just roughed in so I ended up repainting most of it with various opaque combinations of Burnt Sienna, Thalo Green (Yellow Shade), Thalo Blue and Sap Green. I'm not totally happy with that approach. The other greens in the trees are a hodgepodge of Sap and Thalo Greens, Hansa Yellow Light and Medium and a little Burnt Sienna. Hansa Yellow Light predominates and makes the trees very bright because it was applied directly to the white canvas. The colors are nice and bright, which I really liked when I initially finished the painting but which lost some of their appeal as I spent some time with it. 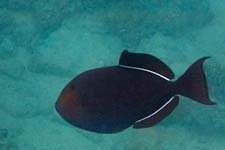 The problem may lie more in the opacity and lack of definition in the darks than with the brightness of the highlights. I like the mountains and the field quite alot, the clouds and trees not as much. Still, for 10 hours and a new palette, it's certainly acceptable. Tunnel Marathon registrations are up to 225, including 10 mail-ins. We've added 65 this past week. Since I'm not sending out any more emails, I think we'll add only about 30 per week, so my current estimate of when we'll fill is May 15. This was my fourth, and at 6:30 my slowest, Yakima Canyon Marathon. I've now run one at each hour increment from roughly 3:30 to 6:30. My excuse this time was that I walked much of it with Don Kienst, the "Rev" but that's only an excuse since I wasn't planning to finish in under 5 hours anyhow. Other than the Mercer Island Half last weekend and the Invest In Youth 6 hours back on the 3rd, I've only done a few short runs all month and I wasn't even sure I'd be able to go the full distance. But of course I did, and thanks to all the walking I didn't even feel that bad afterwards though my legs were a little beat up and my hamstrings rather tight. Susan and I drove over yesterday. Just before we left I was able to book a room at the Day's Inn right at the start. We left later than planned so didn't do any sightseeing, stopping only in Cle Ellum for dinner at Lentine's, an Italian place just off the main drag. I had ravioli in sage butter sauce and Susan had the pesto, both very good, if a little rich for the night before a race. When I mentioned the marathon our waitress remembered talking with me last year, when Monte and I stopped for dinner and sat at the next table over. I think I had the ravioli then as well. We arrived at the Days Inn in time for a relaxed evening and made it to bed before 11PM, early for us. The air was filled with wet snowflakes when I looked out the window in the morning but no snow had accumulated on the ground. I dressed warmly and didn't regret it, though I did regret sleeping in because I missed out on visiting with the many Maniacs hanging around the motel before the race. I barely had time to pick up my bib, get dressed and eat a bit of breakfast. Susan accompanied me out to the start. I brought a pen and notebook for birding but due to the weather I carried neither binoculars nor camera, and regretted the lack of both because I ended up spotting quite a few birds, and the canyon in fog and snow was even more beautiful than usual. I tried taking photos with my cell phone but most came out blurred. It may take a painting to do the scenery justice. I met up with Rev around mile five, already over an hour into the race thanks to a potty stop at the little lakeshore park just north of the canyon entrance and a birding stop or two before that. At the lake I found a big flock of swallows and my fifth Osprey of the day. I told Rev about the birds, and a little about the geology of the canyon. We talked about running and marathons, which ones we liked, when we started running, how we ended up becoming Maniacs. He signed up after running Marine Corps and New York on successive weekends, having signed up for both intending to run either one or the other depending on the weather. In the eight years since then he's run 70 or so. We talked about training and I went on for a while about my various observations on the correlation between pace and weight, heart rate, elevation change, wind etc. He suggested I write an article about it. I asked him what kind of minister he was and learned he had been of the American Baptist persuasion. I told him about the five generations of Baptist ministers in the Wood family and we went on the compare notes on our spiritual journeys and current beliefs. To him, Jesus is what's (or who's) important, and not all the other beliefs that people argue over. He has no more affection than I do for the many Christians out there who believe that their own, or their community's, beliefs should be imposed on society at large. Doesn't care much either for the politicians who hypocritically pander to those Christians to advance their own agendas. absorbed in conversation we passed the miles quickly (in relative time) if not entirely comfortably. Starting up the hill at mile 22 we caught up to Bob Dolphin, four miles from the finish of his 500th marathon. I continued on ahead with Takao, who was carrying not one but two Nikon DSLRs, a D90 and a D7000, to document Bob's 500th. Takao had a 70-200 f2.8 on the D7000 and photographed two distant birds for me so I could identify them. He finds the low light performance of the D7000 noticeably superior to the D90. I ran mile 26 in 10:12 making it one of my fastest, and picked up bird species #40, a Yellow-rumped Warbler, in the last 0.2 mile before the finish. Susan arrived about 20 minutes later just in time to see Bob cross the finish line and be crowned with a laurel wreath. Susan hadn't checked out yet so we drove back to the start and I got a quick shower. I didn't feel like driving back down to Yakima so we at in Ellensburg at Morelli's after a quick stop across the street at the Iron Horse brewery outlet to get my growler refilled. After tasting all five of their offerings on tap I decided on the Malt Bomb brown ale, a little lighter than Irish Death with a hint of honey. A growler is alot of beer but it only cost $8 and should last me a week or more. As sunlight began to spread across the valley we drove back down into the canyon. Susan marvelled anew at its beauty. At Umtanum Creek we stopped to go for a little hike, following a footpath up the slope to the north of the mouth of the creek. As I suspected it led to an old petrified wood digging, now filled in with basalt cobbles slumped in from above. I didn't see much of any quality in the fan of chips drifting downslope from the spot. Returning across the bridge, I spotted a pair of Wood Ducks paddling along the bank and pulled off a few photos despite the low light. I've been thinking about a painting of Wood Ducks and was delighted to come across them. Following 13 other new birds I picked up during the marathon, the Wood Ducks made 115 species for the year to date.